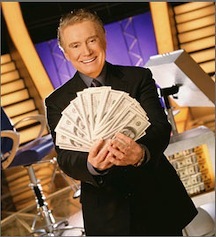 The writers' strike, now very likely to endure into next year, has networks looking to game shows as prime-time putty. CBS is bringing back Power of 10, NBC will return 1 vs. 100 to Friday nights, ABC has a British import called Wanna Bet on tap and Fox will be strapping contestants to lie detectors this January in The Moment of Truth. None of these shows is likely to measure up to the all-time greats of game-dom, though. Here's a list of TV's 10 top quizzes, with the last four especially tough to rank. Even harder: leaving out the likes of Family Feud, Password and Match Game. Excluded are reality competitions such as American Idol and Survivor. What we're looking for are traditional in-studio concoctions hosted by convivial emcees. 10. Let's Make a Deal (premiered Dec. 30, 1963) -- Prospective contestants dressed idiotically in hopes of being called on to win either a grand prize or a hunk of junk. Host Monty Hall kept the daily freak show rolling before offering two lucky players a chance to win the "Big Deal of the Day," hidden behind one of three doors. Contestants went really nuts a lot. 9. The Dating Game (premiered Dec. 20, 1965) -- A trio of men or women tried to be witty, charming -- or smarmy -- while answering questions posed by an unseen suitor. One of them then was selected to enjoy an all-expense paid date with their mate at an exotic setting such as The Hideaway Inn in Barstow. Host Jim Lange famously kissed the show off with a big "mwaaa" in tandem with the winning couples. A surprisingly potent list of celebs played along through the years, including Tom Selleck, Sally Field, Willie Nelson, Michael Jackson, Suzanne Somers, Burt Reynolds, Arnold Schwarzenegger, Karen Carpenter, Steve Martin, Farrah Fawcett, Mark Harmon and even Groucho Marx. 8. The Newlywed Game (premiered July 11, 1966) -- Likewise a Chuck Barris production, this oft-ribald confection got to the essentials of "making whoopee" and other activities of early married life. Host Bob Eubanks, who effortlessly developed a superiority complex, quizzed grooms and then brides on their spouses' most likely responses to questions such as, "My husband likes to watch me _______." The winning couple received their own customized prize package. 7. 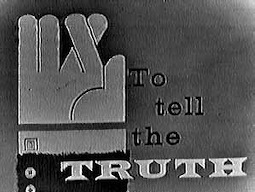 To Tell the Truth -- (premiered Dec. 18, 1956) -- Bud Collyer and later Garry Moore smoothly hosted this evergreen guessing game, with actress/socialite Kitty Carlisle its most accomplished celebrity panelist. Each segment featured three guests all claiming to be the same person. Their answers, some of them amazingly convincing, were used to separate the two impostors from the actual person of import. Incorrect deductions from the show's panelists initially paid off at the rate of $250 a pop. Fakers over the years included Cicely Tyson, Lauren Hutton and Tom Landry, then an assistant coach with the New York Giants. He posed as a missionary who flew his own plane. 6. What's My Line? (premiered Feb. 2, 1950) -- Plain-faced, bow-tied John Charles Daly became one of the best-known TV stars of the 1950s in this staple of early Sunday night TV. Daly presided over a panel of guessers that regularly included Bennett Cerf, Dorothy Kilgallen, Arlene Francis and Steve Allen, who coined the show's signature question, "Is it bigger than a breadbox?" 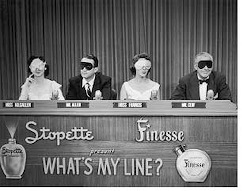 After struggling with the occupations of commoners, panelists wore blindfolds during the show's climactic celebrity round. Among the many A-listers disguising their voices were Frank Sinatra, Lucille Ball, Marlon Brando, Judy Garland, Mickey Mantle, Elizabeth Taylor, Ty Cobb, Nat King Cole, Barbara Walters, John Wayne, Ronald Reagan, Bette Davis, Sammy Davis Jr., Dustin Hoffman, Diana Ross, Warren Beatty and Barbra Streisand. 5. 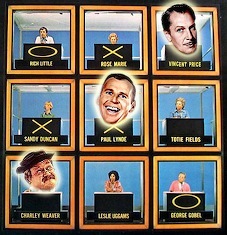 The Hollywood Squares (premiered Oct. 17, 1966) -- Peter Marshall proved to be a perfect host, but Paul Lynde made the show go from his featured perch in the show's Tic Tac Toe-y "Center Square." Sample question: "In The Wizard of Oz, the Lion wanted courage and the Tin Man wanted a heart. What did the Scarecrow want?" Lynde riposte: "He wanted the Tin Man to notice him." The show's lore also says that celebrity Jack Palance once dozed off in his Square during taping. Subsequent versions were hosted by Tom Bergeron and Whoopi Goldberg, but the vintage Squares show still can't be topped. Other key players during its long run included Charley Weaver, Wally Cox, Rose Marie and George Gobel. Happy together: Pat and Vanna, Ken and Alex. 3. Wheel of Fortune (premiered Jan. 6, 1975) -- Chuck Woolery and Susan Stafford were the original hosts, but Wheel got rolling when Pat Sajak and Vanna White stepped in. She turned letters and heads while he parried with contestants. They've now presided for 25 years over a game that couldn't be simpler -- or more addictive. 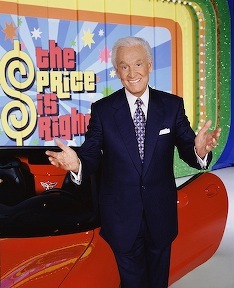 The late Merv Griffin created the show, which originally was called Shoppers Bazaar before wiser heads prevailed. Wheel also has become a popular casino slot game, where its gaudy colors are very much at home. 2. Jeopardy! (premiered March 30, 1964) -- Still cerebral after all these years, this second Merv Griffin cash cow dawned with capable Art Fleming as host before being canceled in the last 1970s. It returned in 1984 with the at times condescending Alex Trebek in the saddle. 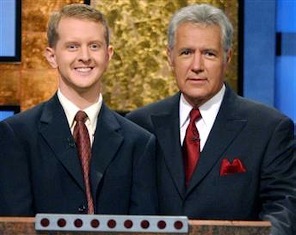 Parodied to great effect on Saturday Night Live, the show also soared on the strength of contestant Ken Jennings' record, multi-million dollar winning streak. Its signature mood music during the climactic "Final Jeopardy" round arguably is more recognizable than "The National Anthem." 1. The Price Is Right (premiered Nov. 26, 1956) -- Bespectacled Bill Cullen hosted the show's first incarnation, which lasted until 1965. 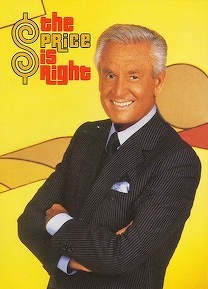 Then after a seven-year void, America's long national nightmare ended with the 1972 debut of Bob Barker as Price host. He braved all forms of hysterical contestants for 35 years before giving way to Drew Carey this fall. The show's daily "Showcase Showdown" is ingrained in the public consciousness, as is "Plinko," Price's giant spinning wheel, "C'mon down!!!" and the closing admonition to spay or neuter your pets. College kids also embraced the show, both in dorms and as contestants. In the annals of pop culture, its actual retail value has long been priceless.